The global chemical industry has long been the best real-time indicator of the global economy. This is partly because of its size, as the third-largest industry in the world after agriculture and energy, but also because of its global and application reach. Every country in the world uses relatively large volumes of chemicals, and their applications cover virtually all sectors of the economy, from plastics, energy and agriculture to pharmaceuticals, detergents and textiles. As can be seen, there is extremely close historical correlation between the two sets of data. But crucially, the ACC data are real-time. They are produced within a few weeks of the end of each month, whereas the IMF data only appear after a time lag of many months. Equally important is that the IMF’s forecasts have proved to be wildly over-optimistic since the start of the financial crisis, as demographic headwinds have now replaced the tailwinds which created the baby boomer-led supercycle that began in 1983. Had the ACC’s data been used as the base case, unnecessary investment would have been discouraged. Even more importantly, policymakers’ wishful thinking about the ability of monetary policy to restore economic growth would have been challenged much earlier. Brazil has been the most consistent, but unfortunately in a negative sense. Its chemical production went negative in mid-June 2014, providing investors and companies with ample warning that major problems lay ahead for the economy. The chart provides some hope that the situation may be improving, but cautious observers may be forgiven for worrying that production has yet to record a positive performance after more than two years. Russia has provided the most volatile performance, due to oil price movements. The key issue is that lower oil prices support chemical demand, as consumers need to spend less on essentials such as transport and heating and have more discretionary income. Production was down 11 per cent in July 2014, just before the oil price collapse, but then rebounded to a positive 15 per cent by September 2015. Since them, of course, the doubling of oil prices since the New Year has hit output again, leaving it up by around 5 per cent. India has also been volatile. Production tumbled during the run-up to premier Narendra Modi’s election in 2014, and remained negative into the early part of 2015. Since then, production has been in positive territory, averaging around 4 per cent since March 2015, as tangible evidence of economic reform has begun to appear. China has provided the most stable performance, with production fluctuating between a low of 3 per cent and a high of 10 per cent over the period. Key support has been provided by the government’s drive to increase China’s self-sufficiency. 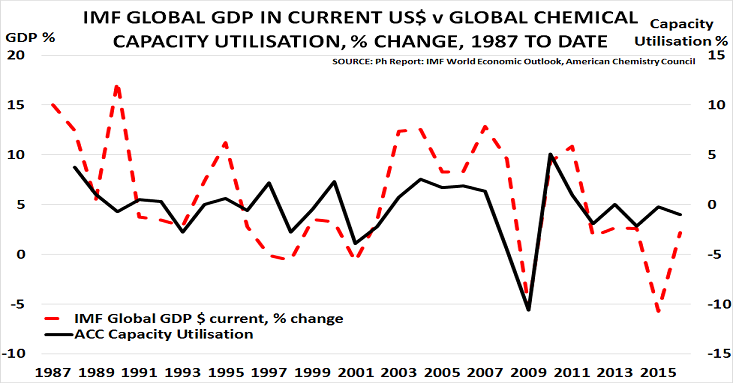 This has often meant that imports, rather than domestic production, have taken the pain of slowing domestic demand. In some major products, such as PVC, China has actually moved from being the world’s leading importer to become a net exporter. 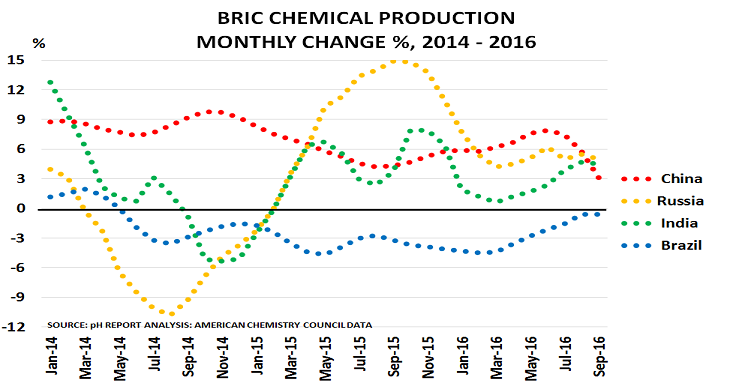 Chemical industry performance is therefore not just an excellent guide to the outlook for the global economy. It is also a reliable indicator of the economic state of the world’s major economies. The fact that the global CU% has fallen every month this year, and is now at just 78.8 per cent – nearly equal to its post-crisis low of 77.7 per cent in March 2009 – is therefore grounds for concern. It contradicts the buoyancy being seen in a number of major financial markets and suggests that investors may find it is better to travel in hope than to arrive. Paul Hodges publishes The pH Report, providing investors and companies with insight on the impact of demographic changes on the economy.